We thought that they were lost forever. We thought that these incredible videos would never see the light of day again. But we were wrong! Originally produced on VHS tape in 1998 and only on sale for a couple of years, sadly the master VHS tapes were lost when the video reproduction company ceased trading, and for many years all hope of further production of the ‘Allain the Teller of Tales’ video faded. Then in 2018 by sheer luck the original studio U-Matic video tapes were discovered in a cardboard box! A company who still had the ‘obsolete’ equipment to read the U-Matic tapes was found and the tapes carefully transported to their studios. 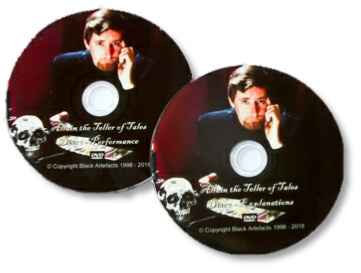 The video was then successfully digitised and edited with new titles and credits, so now a whole new audience and generation of aspiring and practicing bizarre magicians, and those interested in a different way to present their magic, can learn about the art of storytelling magic and enjoy the superb performance of Frank Allen as Allain the Teller of Tales. Even better news is that the original VHS tapes, being PAL, were only available for Europe, but now on DVD these videos can be viewed wherever in the world you live. Disc One - Introduced and presented by Gordon Astley and filmed at a genuine haunted house, features Frank Allen’s spellbinding act as Allain the Teller of Tales. Tales of contracts with The Devil, the sorcerer’s apprentice who gets more than he bargained for, a traveller who meets the Dark One himself and a clergyman who finds just how powerful the forces of evil are and a wooden cross that burns it’s way through a deck of tarot cards - until it reaches ‘The Devil’. Disc Two - Gordon Astley interviews Allain the Teller of Tales in his alter ego of Frank Allen. Frank explains the ‘workings’ of the effects in his act, Gordon and Frank discuss the thoughts and processes behind the tales - the character, the scripting and the performance itself. This DVD set is an inspiration to those thinking about dipping their toes into the waters of ‘Bizarre Magic’, and a veritable goldmine of information to those who have already taken the plunge. The Black Hart is proud to be able to bring these recordings back to life and make them available once more. Explanations of the routines and the ‘effects’ within, plus discussions about scripting, presentation and character.